Guajes (Huajes) are an exotic vegetable consumed in Mexico and some South East Asian countries. The seed pod of the Leucaena tree, guajes look like incredibly long sugar snap peas. Both the outer pods and inner seeds of guajes range in color from bright green to rust red (and sometimes green with red blotches). That red tint (when they have it) is normal. Apparently the outer pods of guajes can be chopped and used to flavor dishes (they have a significantly stronger garlic bite but are rather woody)…but all the recipes we’ve seen call for just the seeds. In order to extract the seeds, you need to peel the pods. Doing so can be tricky at first, but with the right technique and a little practice it’s a breeze – fairly similar to opening pea pods. 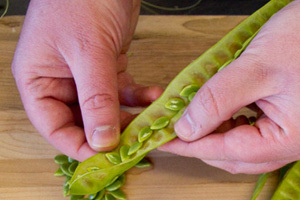 First, remove the pods from the stem. Take one pod and hold it with the stem-side facing towards you. Pinch the pod on the bottom (non-stem side) with your fingers and tear to take off the end. Try to peel off some of one of the side “strings” as you tear the end off. Push forward with your finger to begin to separate the two halves (this is the tricky part). Once you’ve got a gap, angle your fingernail towards the more robust of the side ribs (so that you’re splitting the weaker one as you push down). Continue to push through the pod, pulling the two sides apart. Don’t pull the sides at too sharp of an angle or you may break one of them off. The seeds will either pop out on their own or can easily be brushed out. Repeat with the other pods. Once you’ve extracted the seeds, they can be used raw or cooked. If you’d prefer to eat them as a tasty snack, try lightly toasting them for a more nutty flavor.